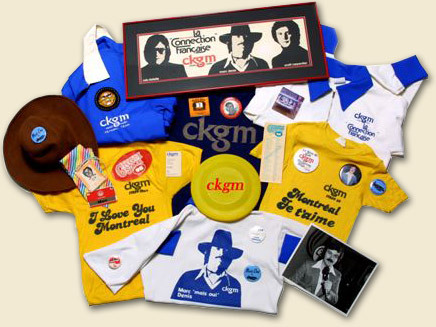 Marc Denis' 98 CKGM radio Super 70s Memorabilia Page, Montreal, Canada. 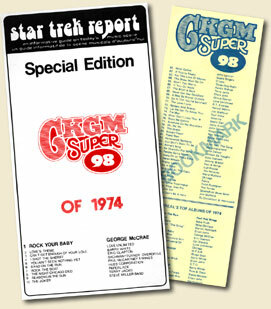 Marc Denis' 98 CKGM radio Super 70s Tribute Page, Montreal, Canada. 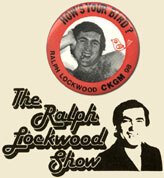 October 1977: Can retired Montréal Canadiens’ legend Henri Richard deliver three morning sportscasts on the Great 98? That is the challenge put forth by CKGM sports director Jim Bay. If Henri succeeds, Jim vows to don a waiter’s apron and serve the patrons at Henri’s Park Avenue Brasserie that very evening. You guessed it! 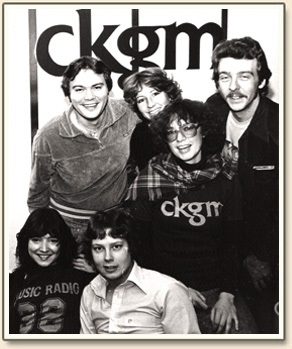 The Pocket Rocket delivers the hat trick on the radio in the morning and many members of CKGM’s Super 70s staff just happen to drop by in the evening to make sure Big Jim is delivering on his end of the deal. 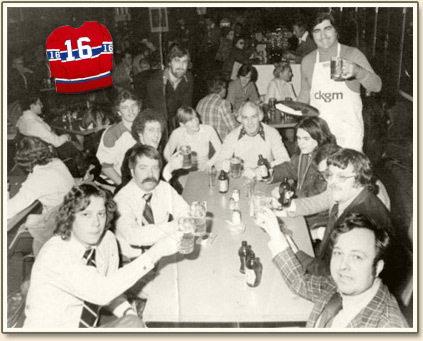 Enjoying a round of Super 70s “stubbies”, left to right: David Wolfe (CKGM Promotions Director and Jock), Tom Castle (Sales), Doug Price (Production), Tony Van Doorn (Op, in Habs sweater), Mark Burns (News Director, standing), Hillary McLeod (News), a beaming Henri, a very busy Jim Bay (nice apron! 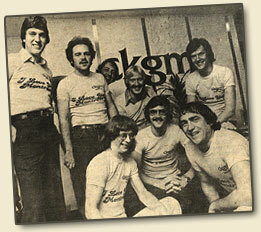 ), Danny Hughes (Op), Laurent Lavigne (News, almost seen), Greg Sullivan (Sales) and Steve Naymark (Sales). Santé à toute la gang ! 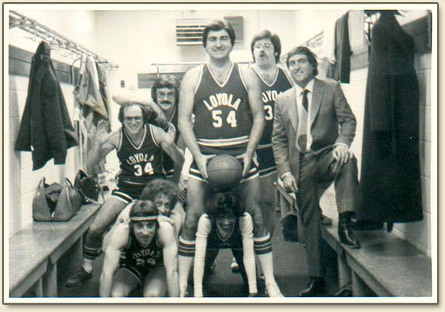 September 1979: The CKGM / Loyola Super Slackers prior to taking on the legendary Harlem Globetrotters at the Forum, proceeds to the Ste-Justine and Montreal Children's Hospitals. 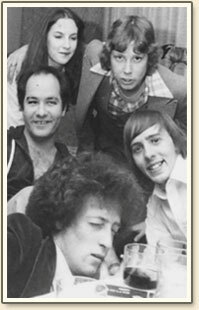 Top, left-to-right: Buster Bodean, Marc “Mais Oui” Denis, Big Jim Bay, Almost-as-Big Dan Willmott and MC Ralph Lockwood (in the dapper Dorion Suit. Ralphie can't play because of an apparent last minute injury...a “sore bird”). 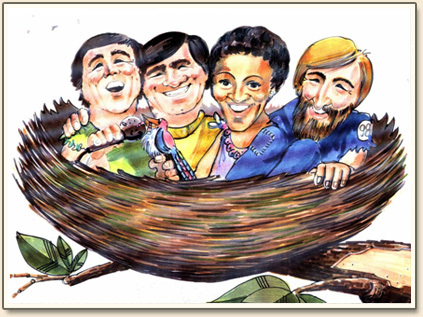 Kneeling, left-to-right: Mitch Snaden, Doug “Curly Neal” Price and traffic reporter Omega Medina...who always knows how to get out of a jam. The final score? Don't ask. 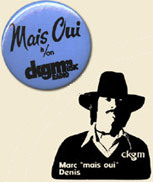 Marc Denis would host on CKGM during the 70s. 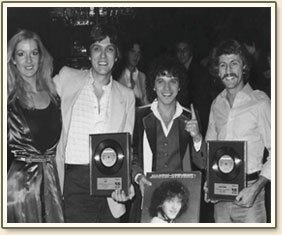 Number 1 song of the year in Montréal in 1974? still leads the band today. 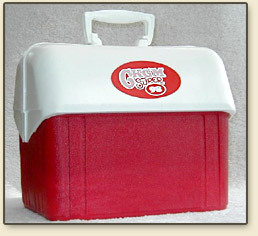 Mai 1974 : le fameux panier de pique-nique CKGM Super Summer '74 à gagner pendant tout l'été 1974. 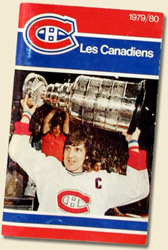 May 1978: the Montréal Canadiens have just won yet another Cup. WVBF Boston DJ Jeff Baker, who lost his Bruins Stanley Cup bet, to Marc “Mais Oui’’ Denis, visits CKGM prior to the Habs mammoth victory parade. It will be a long and messy adventure down Ste-Catherine St. for Jeff in his Boston Bruins jersey! 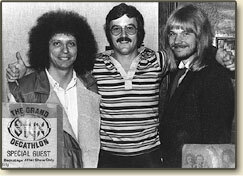 Left to right: CKGM Promotions Director & jock David Wolfe, Jeff Baker and a jubilant “Mais Oui’’. anthem “In The Playoffs (Go Habs Go!)”. 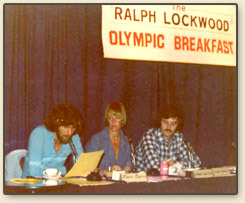 August 1976: the CKGM Ralph Lockwood Olympic Breakfast live from “Le Portage” at Hotel Bonaventure as Montréal welcomes the world once again. 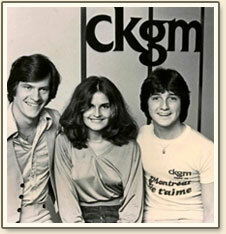 Left to right: CKGM news director Mark Burns delivers the morning headlines while traffic reporter Bonney Truscott and evening jock Marc “Mais Oui” Denis await their cues. Ralphie is standing by in the local and international breakfast crowd with microphone and “bird” firmly in hand. 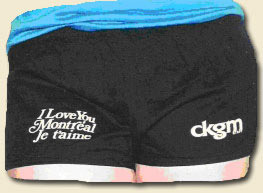 chandail CKGM "Montréal, Je t’aime"
Doug Price (jock), Chris Coyle * (op). 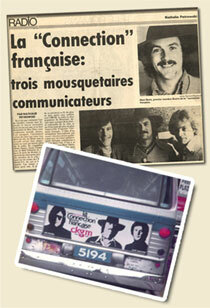 1979 : ’Grease is the word’’ et CKGM a eu son ‘’mot’’ à dire! Randy Bishop dropping in to promote his first single,"Don't You Worry". 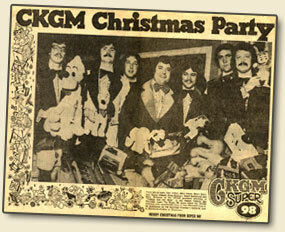 The song places at # 65 on the 1974 year-end CKGM Super 98 Countdown. 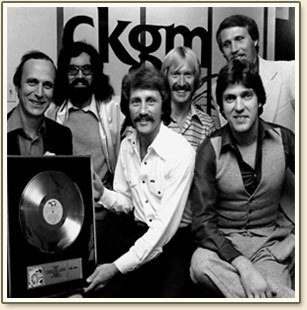 Randy Bishop "Don't You Worry"
December 1975: the fall radio ratings are out and 980 CKGM has made huge gains and is placing ever closer to the top of Montréal’s English and French radio landscape. This is just one of the shots of the many revelers at the ratings party in the offices following announcement of the results. 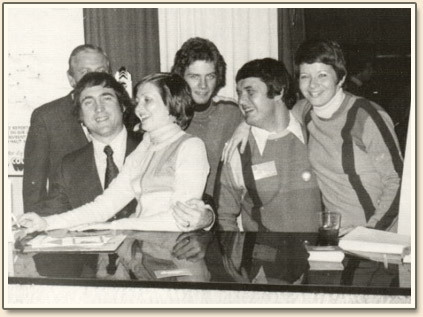 Left to right: Charlie Conroy * (Sales, partially hidden), morning ace Ralph Lockwood, Nancy Bird (Programming Assistant...who has just been asked the obvious trademark question by Ralphie: “How’s your bird”? 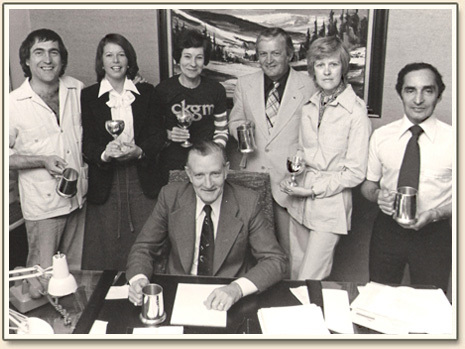 ), jocks Scott Carpentier and Randy Dewell * with Annie Tee (Management Secretary) closing ranks. “Aah yes...a bird in the hand is...not as good as one on your knee!” as Lockwood’s sidekick Professor Frydock would quip. 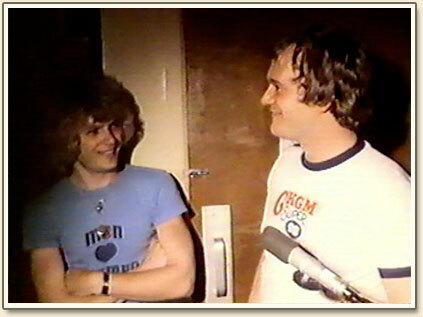 December 1976: You just never know who is coming in for a visit at the Great 98. 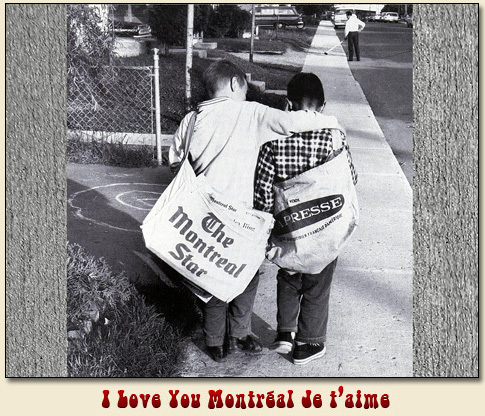 On this day, it’s Montreal-based hit trio Toulouse. 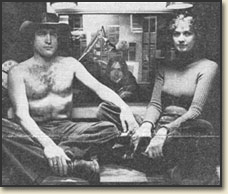 Pictured in the radio station lobby are, left to right top: CKGM Music Director and weekend on-air personality Greg Stewart, Judi Richards (Toulouse), record rep Pete Beauchamp *. 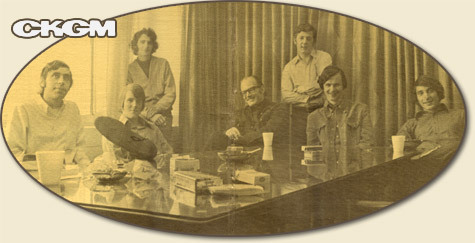 Middle with scarf: Laurie Niedjielski (Toulouse). 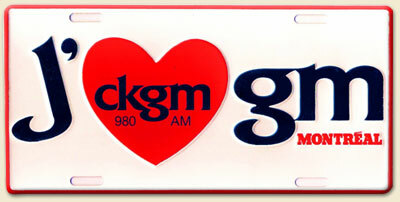 and CKGM Promotions Director David Wolfe. as Jo Anne Rudy celebrates (her first !) 12 years in management at CKGM. Bravo Jo Anne and cheers !